To educate, entertain, and enthuse those who venture beyond the shore. Over 13,186 articles on solo swims, pro races, relays, charity events, eco-swims, stage swims, marathon swims, trends, products, services, personalities, coaches, governing bodies, rules, demographics, books, films, blogs, conferences, camps, clinics, exploits and happenings in oceans, seas, lakes, rivers, dams, canals, channels, fjords, estuaries, lochs, coves, firths, straits, bays, and harbors. Sponsored by WOWSA.org. Courtesy of WOWSA,Huntington Beach, California. Photos courtesy of the Catalina Channel Swimming Federation. 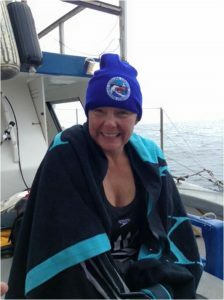 Tracy Clark completed her third Oceans Seven channel on September 22nd with a 12 hour 54 minute crossing of the Catalina Channel. The Catalina Channel Swimming Federation reported, “The Kiwi had some unique encounters with two whales (a mother and a calf) spy hop and breach within only a few feet of her and kayaker, Barb Schumacher. Later in the wee hours of the morning the pilot boat, Bottom Scratcher, experienced three very close encounters with unmanned Navy marine drones.